No Glitter Me Monday nails this week because I was sent some awesome nail wraps from OMGNailStrips to review and finally managed to get them on my nails. That's fourteen different sized nail strips that you should be able to match easily to all of your fingers widths. You can see the width of each strip at the bottom, and they're all about 3cms long-so big enough to cover most nails easily. There is a video on the OMG page that shows you how to apply the strips which I followed almost exactly. The only thing I did differently was that I used each strip for two nails where I could. My nails aren't especially long at the moment and it felt really wasteful to me to have a good 2cm extra on each strip that would just get discarded. Once I had separated the strips from each other on one set and matched them to my nails, I turned them face down and, using the same size strip from the other set as a guide, drew around the curve on the flat end of the strip to make it double ended (I hope this makes sense, I forgot to get a photo!). Then I removed the plastic top sheet from the strip as normal, but before I removed it from the backing I cut the strip in half, and cut around my guide line so I had a curve to fit into my cuticle on each end of the strip. I applied each half strip to my nails as per the rest of the instructions. In total I ended up using 6 out of 7 strips from one set for both hands, which means I definitely have enough to do a full mani again if I wanted to! If your nails are longer you can still get a full mani and some accent nails (with careful trimming) or even use them in some funky nail art like Charlie over at Pocket Money Polishes did with her strips. This was straight after I had applied the strips-no topcoat or anything on top. I did find placement a little tricky on my non-dominant hand and had to take off and re-place several strips before I got them perfectly straight. This wasn't a problem though, because although the strips are sticky, they aren't too sticky so until you smooth them onto your nails you can lift them off and move them as needed. I used a rubber cuticle pusher to smooth them down and make sure they were well fitted in my cuticles and side walls and it worked really well. The next stage of the process was to use a cotton bud dipped in remover (and squeezed dry) to lightly brush over the wraps to help them adhere to your nails better. I tested this with both my normal remover (containing acetone) and acetone free remover and it's definitely something you should only do with acetone free remover as my normal one started to remove some of the design. If you look closely at my ring finger in this picture you can see this at the left hand edge of it slightly. Please don't judge me for the state of my Seche bottle! I wasn't keen on the finish of these before I top coated, they felt slightly sticky, but after TC they feel just like normal polish which is good! I was worried that my Seche might shrink them but there seems to have been no issues, thankfully! I really like these strips. They're definitely not as easy to apply as a plain or glittery mani, but they're really not too faffy-on a par with something like stamping I think. I like the fact you get lots in a pack so you can try them before deciding to do a full mani with them, or use them in different ways. I love the different designs-there's so much choice and there's definitely a lot of options that you couldn't recreate in nail art without taking a lot of time and effort! I'm not sure how long they will wear, I am a little dubious as to their 10 day claims as mine already have some slight tip wear after only a couple-although this could entirely be down to my application and not the strips. I think they're a really simple and fun way to get some funky designs on your nails-plus think how cool this one would look with some Sheer Tints-style colours over the top! You can get OMG nail strips here and each set costs $7.99 (about £5!) and they ship internationally. I think at the moment you can get 5 sets for $25 (about £16) with the code 5PACK and 10 sets for $45 (about £29) with the code 10PACK at the checkout. You can also find them on Facebook, Twitter and Instagram. Phew, what a lot of words! I hope you enjoyed my review though. So I missed last week's A-Z challenge because I just couldn't get what I wanted to actually work and gave up in the end. But I'm joining back in today! I didn't want to do a mani directly inspired by a dress or pattern because I did that for my Copycat mani, so I did something a little different instead. The base for these is Freckles Polish-Ben Dover from her new Prank Call collection. It's a really deep shimmery navy which I think is really pretty! I topped it with Let It Glitter!-Golden Star which is another wintery polish that I really like. On my accents I have also got Essence-Sparkling Water Lily which is a really pretty shimmery white. I also used my old faithfuls-my Barry M nail art pens-for the details. What do you think? Fun, no? Happy 1st December! That means it's officially time for Christmas glitters and I've bought a fair few this year so I thought I'd better crack on using them! This is one coat of Candy Cane over Maybelline-Winner Takes It All. Let It Glitter! is a Dutch indie brand that I've never tried before, but I couldn't resist getting a couple of her Xmas ones this year. Candy Cane is your typical Christmassy colours-red, green and white micro glitter and it's really pretty! I think it would look nice over a black base as well. Look at the dinky bottle! I had planned some nail art with this one but it went out the window so I just glittered them all-yay! I'm finally looking forward to Christmas now I have an income and can actually afford to get stuff for the people I love! So I decided to go a little more daring with my nails today and see if anyone at work minds or even notices! This gorgeous polish is from the Models Own Velvet Goth collection, which I have adored from afar since they first came out and I started seeing swatches of them. I'd heard mixed reviews so I'd never managed to justify dropping £20 on the set but luckily as it turned out I didn't have to! I got all of these in a couple of swaps over the last few months-swapping polishes is my new favourite thing...after buying them of course! The goths are all absolutely stunning matte glittery polishes in different coloured bases-although I personally think they come alive with a lick of topcoat. I used Valerian and on my accents (we're working up to a whole hand of nail art at work lol) I did a layer of Maybelline-Winner Takes It All and did a fun wavy design using some of my french tip guides from Ebay. In these photos Valerian looks really sheer but I cannot see this in real life at all-and I've spent a lot of time peering at my nails today to make sure. I guess it's just my camera. I really like this glitter! It's super pretty and sparkly, and the good news is no-one has noticed at work at all. Baby steps, haha! Right, I'm off to try and do the bazillion other things I need to do tonight, working full time is HARD WORK. Only a day late with these! I'm really struggling balancing work with my home life. I'm sure it's something I might get used to in time but for now I am just wiped out when I get in and doing anything is too hard! For my 'Dark' nails I did a green and black gradient. It was originally going to be purple and black but somehow that idea changed to green and I can't complain too much haha! Polishes used: Revlon-Black Star, Rimmel-Mermaid Green and Camouflage. All gorgeous shimmery colours! I really like these, they're my colours! They feel a bit witchy to me. I'll add all the inlinkz later when I get back from work (still not used to saying that) but I just wanted to get them up for now. 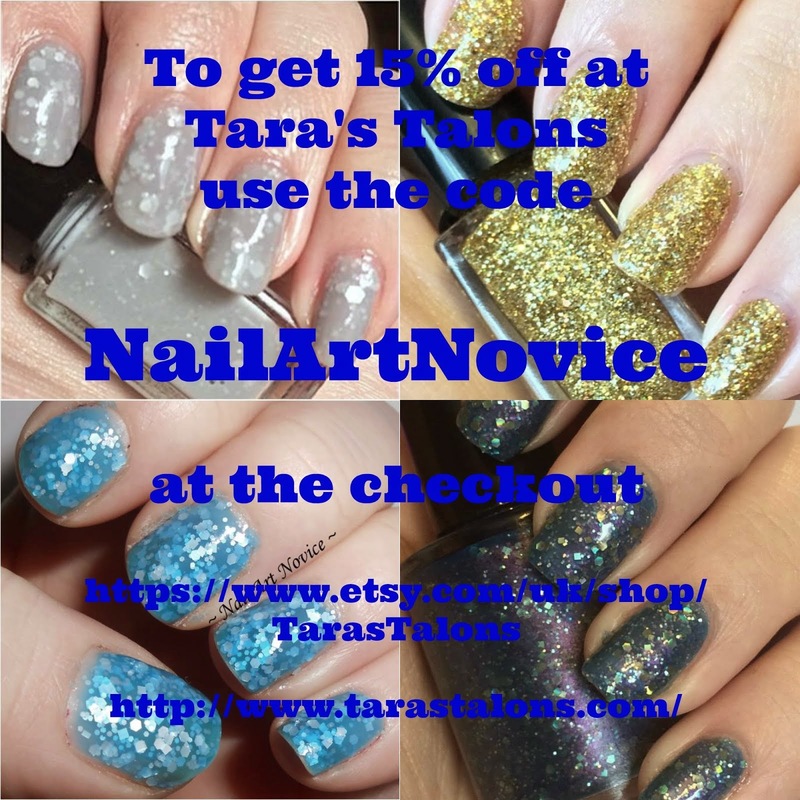 Unless otherwise stated all polishes and products used on this blog have been purchased by me. All content, opinions and photography is my own, unless stated otherwise, where links will be provided to the original content.